You are here: REDWOLF > Home > News >News Detail - Save Airsoft in the UK! On the 8th June 2005, the UK government unveiled plans to prohibit the sale, manufacture import and distribution of ALL replica firearms in the UK. This now falls under the ?Violent Crime Reduction Bill? and unfortunately our beloved hobby and the guns we use to play our sport are in jeopardy. RedWolf Airsoft fully supports the airsoft community in saving our sport in the UK. A new organization has been established to liaise with the UK government on finding ways to keeping airsoft legal. You can do your part by by visiting http://www.saveairsoft.org/ and signing up on our petition to keep airsoft legal in the UK. How does this affect us living in other countries? If the UK successfully restricts the sales of airsoft completely, then other neighboring countries may follow the trend and do something similar. 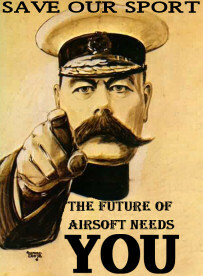 Setting a precedent is never good so help to keep airsoft alive and free!